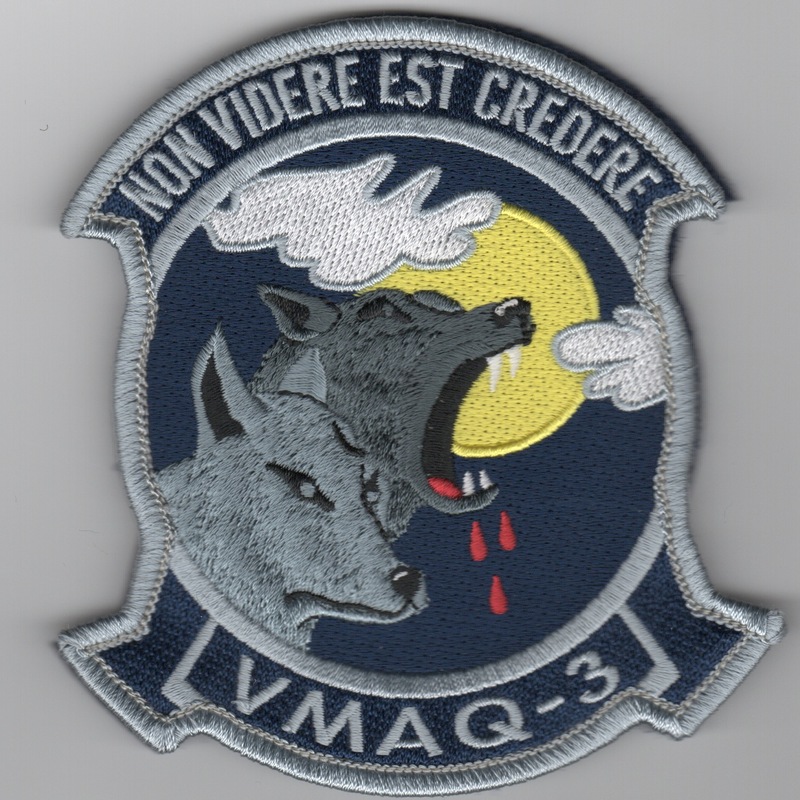 Another AV8RSTUFF creation: This patch was created for VMAQ-3 for their "Last Howl / MOONDOWN / Decommissioning they went through. 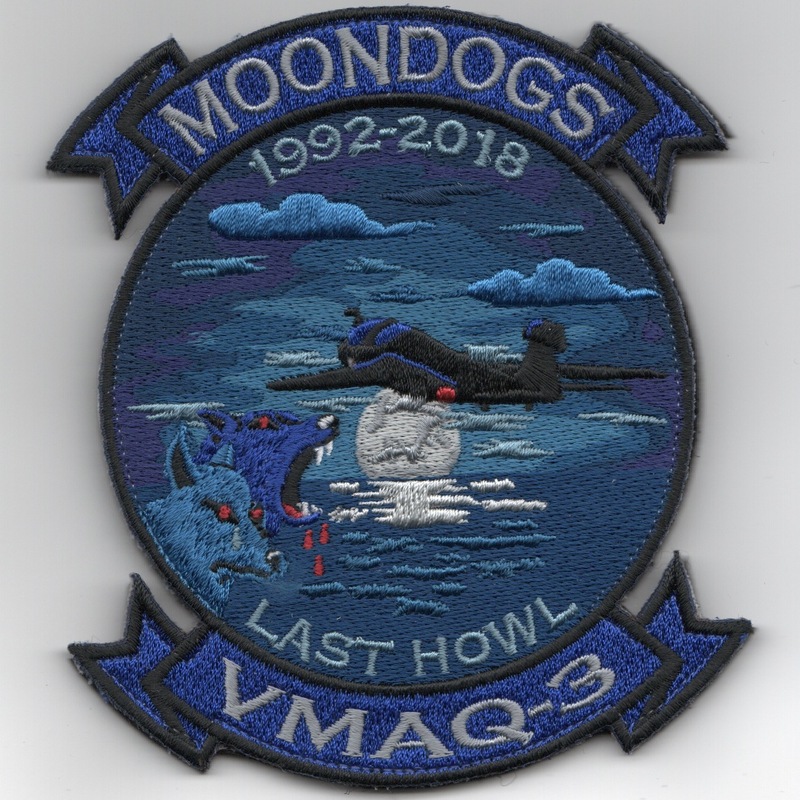 It is in the shape of the standard squadron patch and says "MOONDOGS" across the top with the years 1992-2018, with "LAST HOWL / VMAQ-3" along the bottom. This patch is incredibly detailed (pics don't do justice). It also has velcro attached.....only have a few of them. 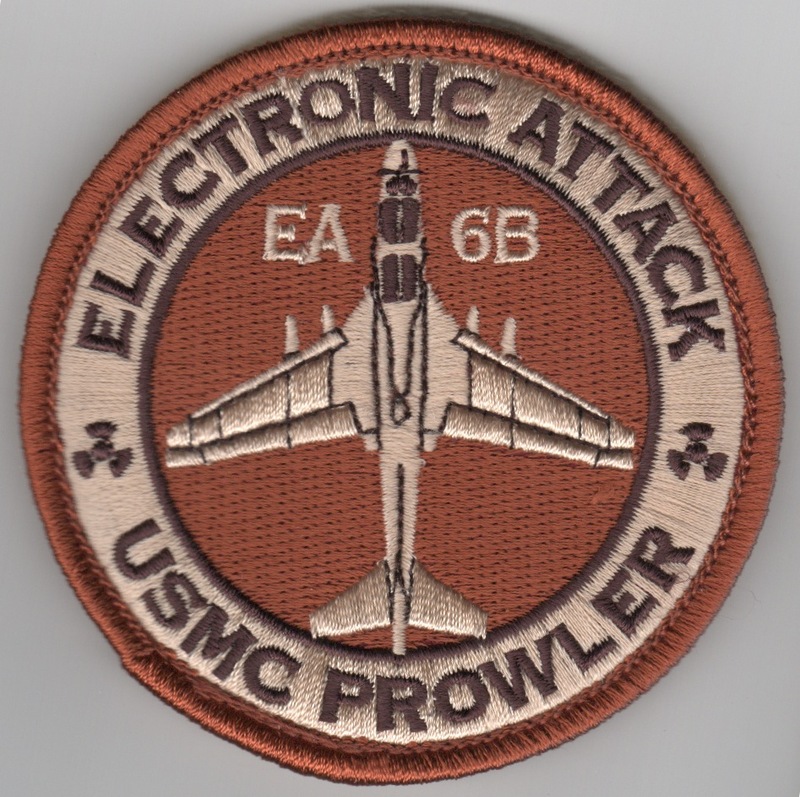 Another AV8RSTUFF creation: This patch was created for VMAQ-3 for their "Last Howl / MOONDOWN / Decommissioning they went through. 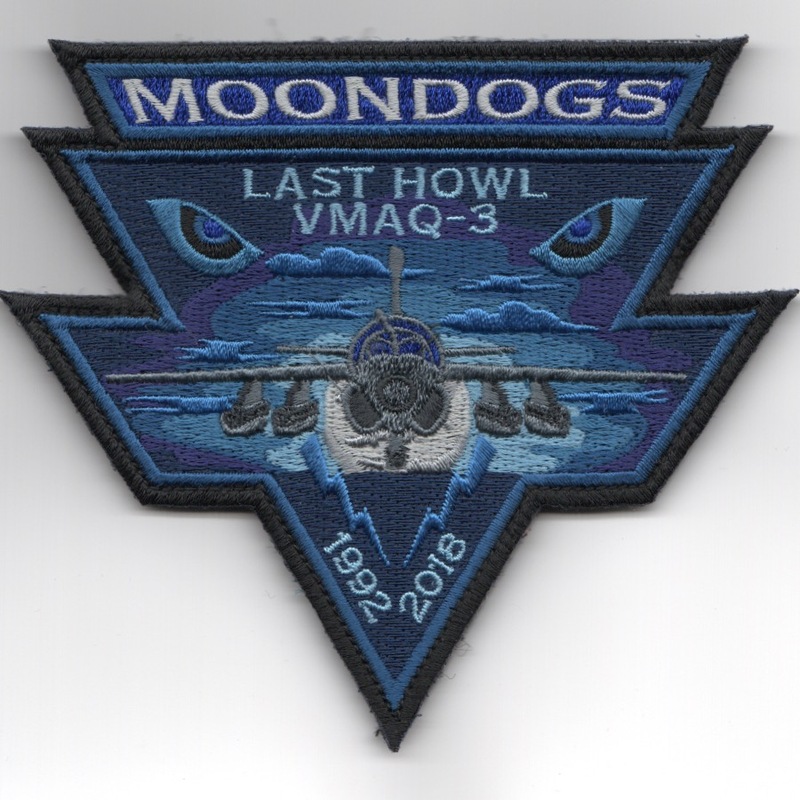 It is in the shape of the standard 'EYES' patch and says "MOONDOGS" across the top with the years 1992-2018, with "LAST HOWL / VMAQ-3" along the bottom. This patch is incredibly detailed (pics don't do justice). It also has velcro attached.....only have a few of them. 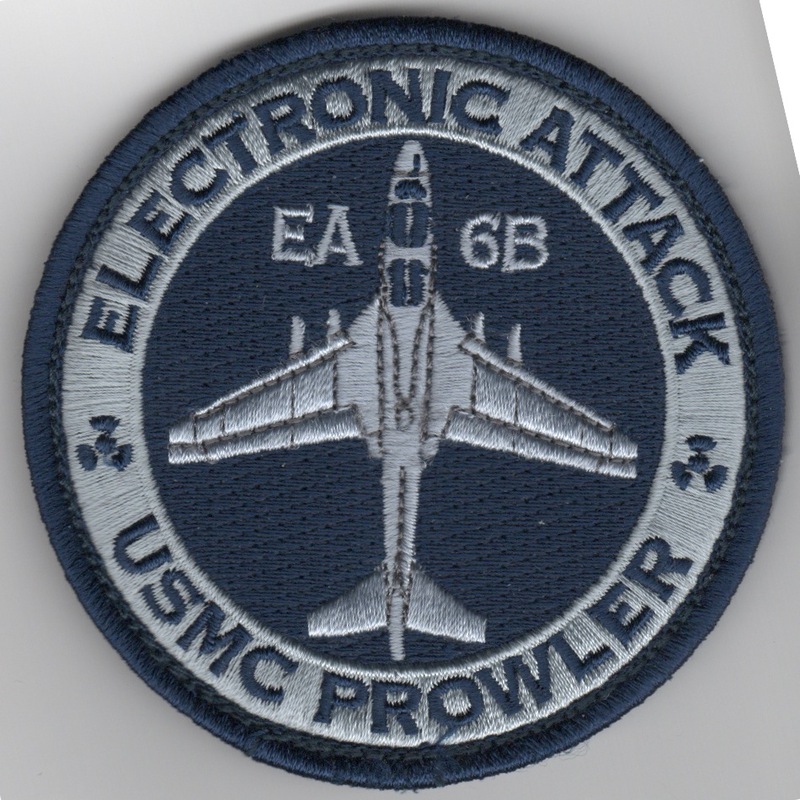 Another AV8RSTUFF creation: This patch was created for VMAQ-3 for their "Last Howl / MOONDOWN / Decommissioning they went through. 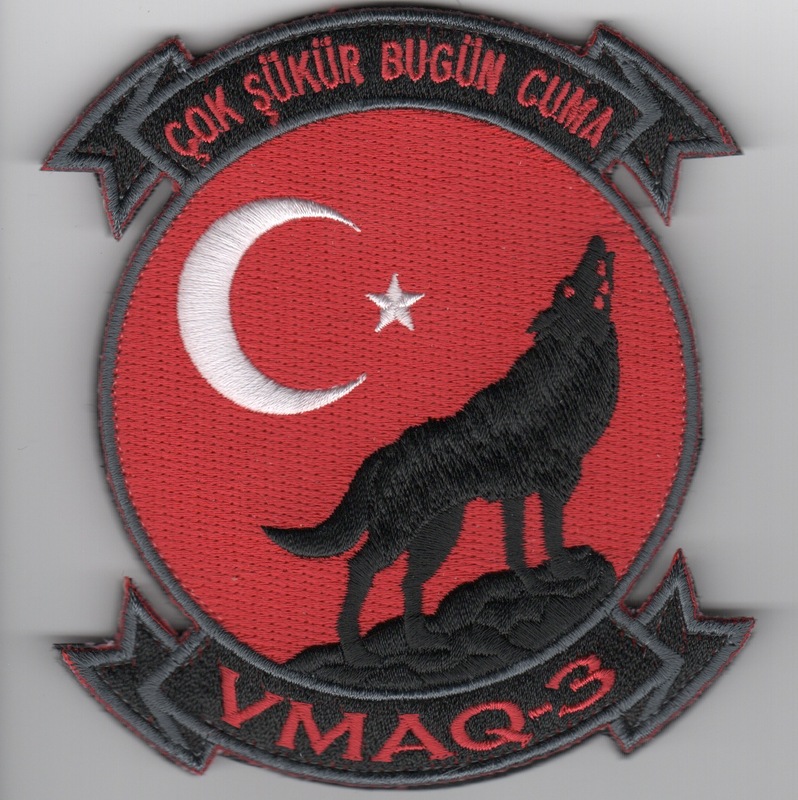 It is in the shape of the standard 'BULLET' patch and says "MOONDOGS" along the bottom with the years 1992-2018, with "VMAQ-3" across the top. This patch is incredibly detailed (pics don't do justice). It also has velcro attached.....only have a few of them. 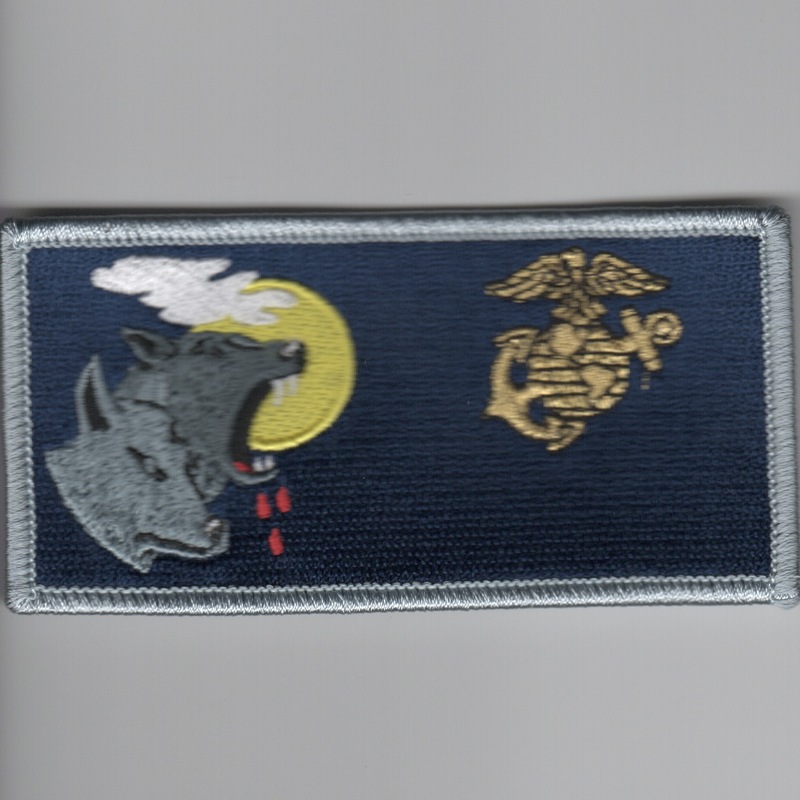 Use this link to get all three "MOONDOG" Decomm patches at a discount. 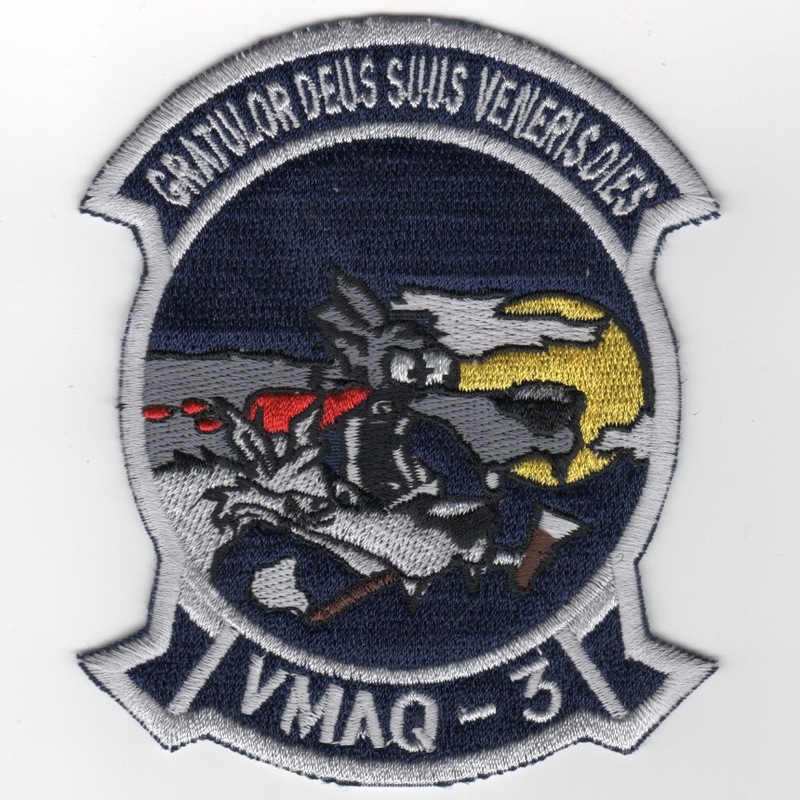 In July 1992, VMAQ-2 split into 3 separate squadrons and formed VMAQ-1, -2, & -3. The "Moondogs" of VMAQ-3 fly the Grumman EA-6B Prowler out of MCAS Cherry Point, NC. This is the blue version of the det patch they created for the "Deliberate Guard" mission from 1997. 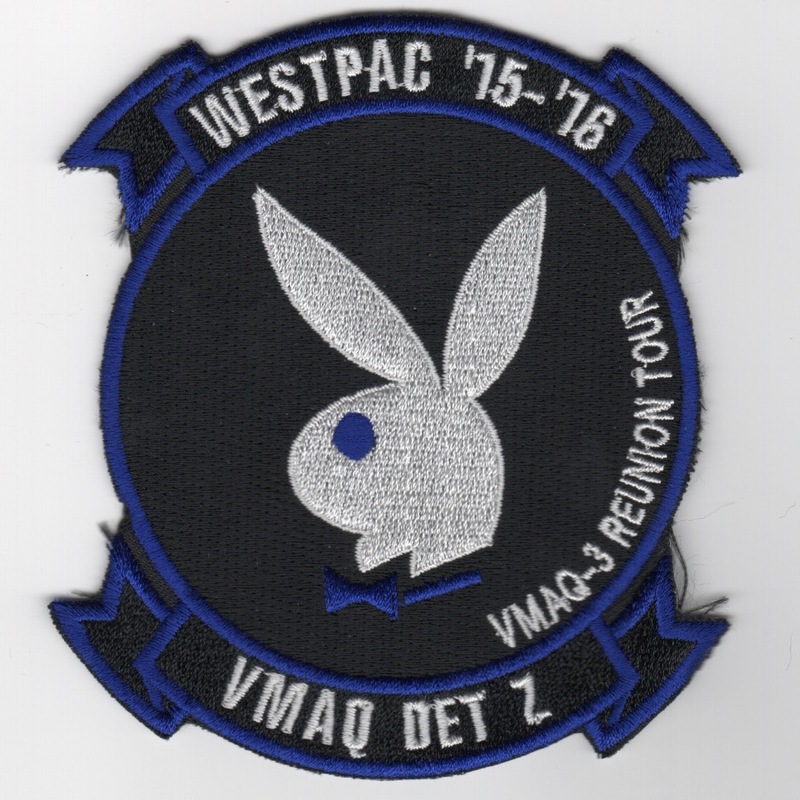 This is the VMAQ-3 2015-2016 WestPac Reunion Tour for their DET-Z that deployed into the Pacific Theater. I ONLY HAVE THREE of these, so you have to email me to get it, as I don't want to put it on the site, then run out before you order. It was found in a Korean embroidery shop recently and does NOT have velcro attached. 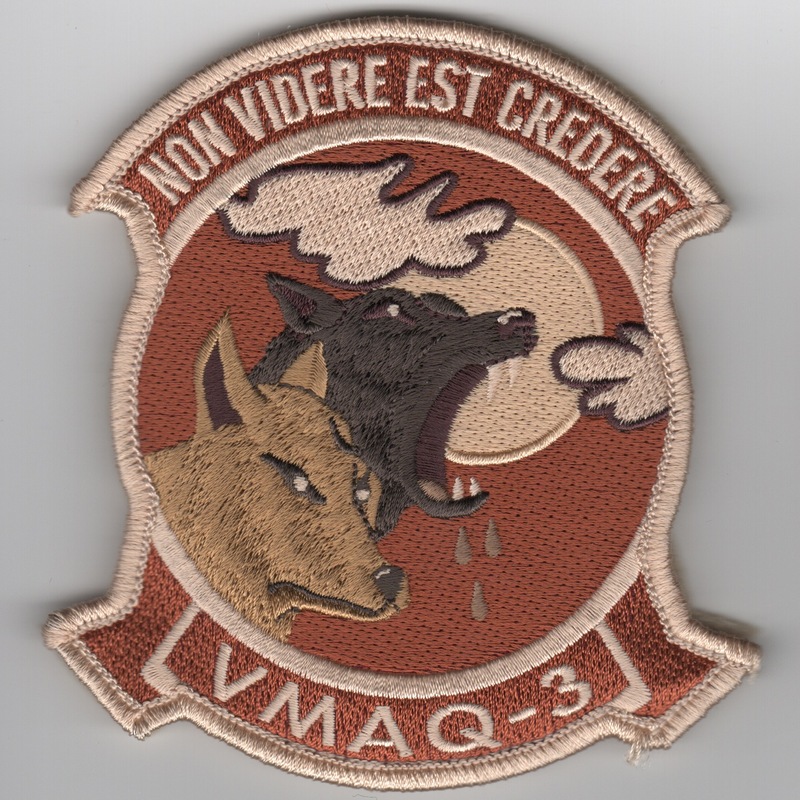 This is the DARK BLUE version of the VMAQ-3 Squadron Patch which depicts two (what I call) "Crazed Coyotes" instead of the normal 'Wolves'. It shows one of them smoking a pipe and the clouds are smoke from the pipe. Found this one in a Korean embroidery shop recently in limited quantities. It does NOT have velcro attached. 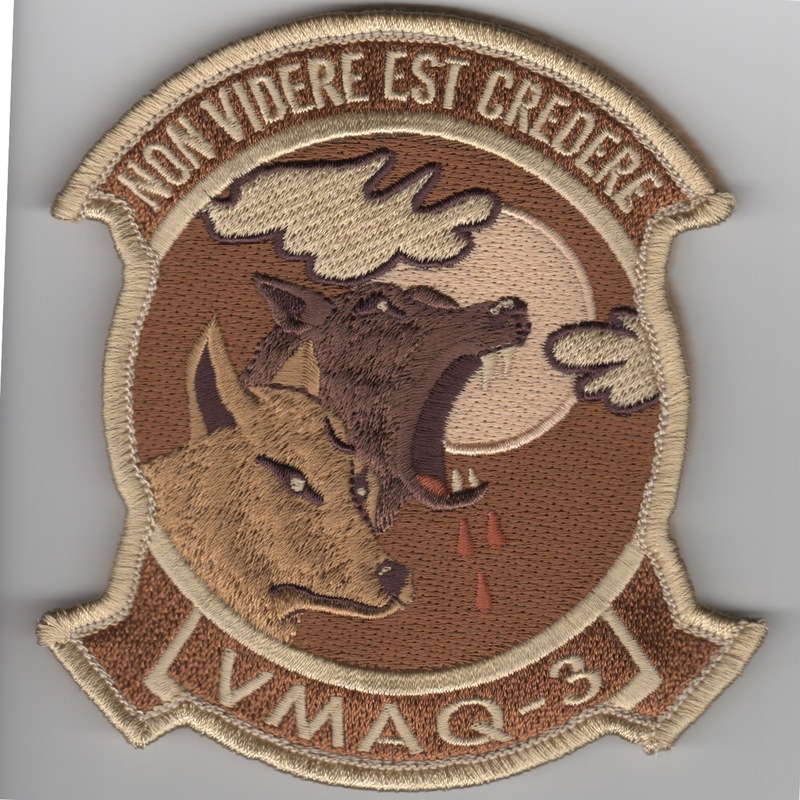 This is the WHITE version of the VMAQ-3 Squadron Patch which depicts two (what I call) "Crazed Coyotes" instead of the normal 'Wolves'. It shows one of them smoking a pipe and the clouds are smoke from the pipe. Found this one in a Korean embroidery shop recently in limited quantities. It does NOT have velcro attached. The Moondogs of VMAQ-3 deployed to Incirlik, Turkey in early 2017 in support of combat operations for Operation INHERENT RESOLVE in supporting the fight against Da�esh. 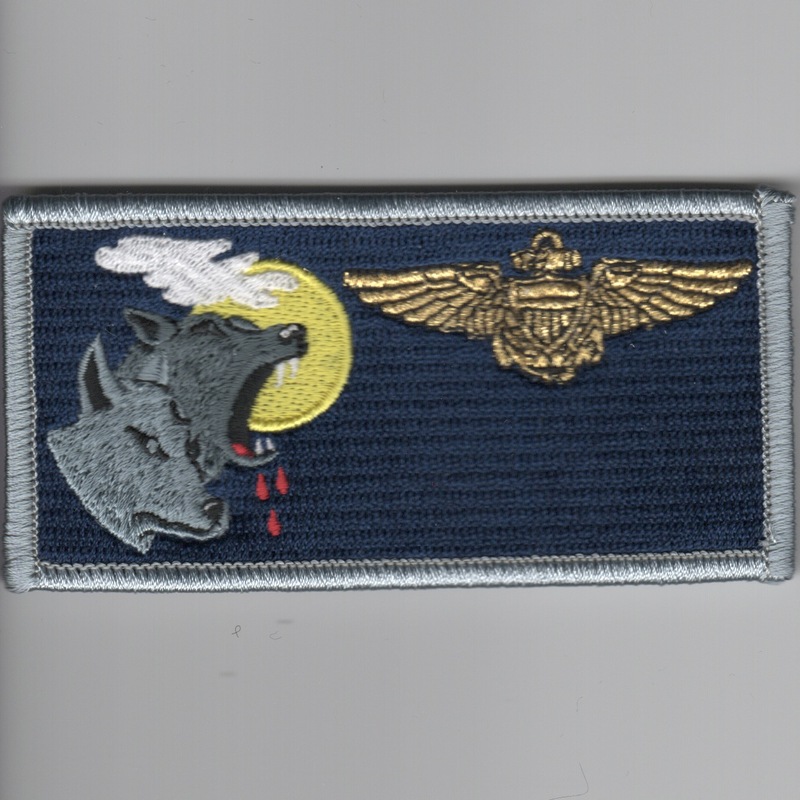 This blue squadron patch was created by AV8RSTUFF for their "normal" (green) flightsuits and notice the difference in the "fur" of the wolves. 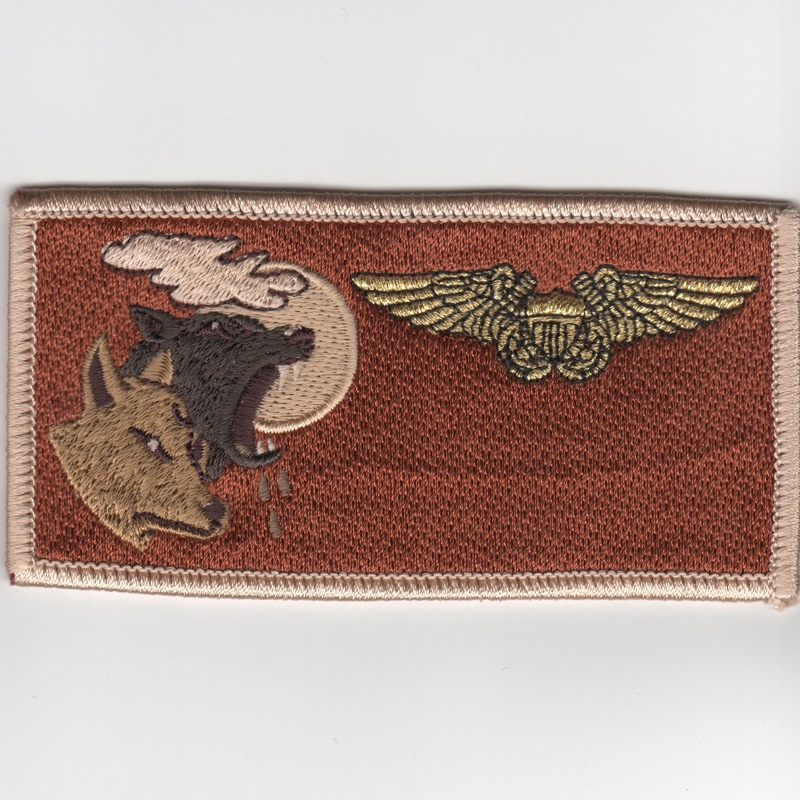 This squadron patch has "furry" wolves instead of the "normal" stitching, and comes with velcro attached. The Moondogs of VMAQ-3 deployed to Incirlik, Turkey in early 2017 in support of combat operations for Operation INHERENT RESOLVE in supporting the fight against Da�esh. This blue EA-6B aircraft "bullet" patch was created by AV8RSTUFF for their "normal" (green) flightsuits and comes with velcro attached. The Moondogs of VMAQ-3 deployed to Incirlik, Turkey in early 2017 in support of combat operations for Operation INHERENT RESOLVE in supporting the fight against Da�esh. This blue nametag with pilot wings with "VMAQ-3" pre-embroidered was created by AV8RSTUFF for their "normal" (green) flightsuits and comes with velcro attached. The Moondogs of VMAQ-3 deployed to Incirlik, Turkey in early 2017 in support of combat operations for Operation INHERENT RESOLVE in supporting the fight against Da�esh. This blue nametag with NFO wings with "VMAQ-3" pre-embroidered was created by AV8RSTUFF for their "normal" (green) flightsuits and comes with velcro attached. The Moondogs of VMAQ-3 deployed to Incirlik, Turkey in early 2017 in support of combat operations for Operation INHERENT RESOLVE in supporting the fight against Da�esh. This blue nametag with pilot wings with "MOONDOGS" pre-embroidered was created by AV8RSTUFF for their "normal" (green) flightsuits and comes with velcro attached. The Moondogs of VMAQ-3 deployed to Incirlik, Turkey in early 2017 in support of combat operations for Operation INHERENT RESOLVE in supporting the fight against Da�esh. This blue nametag with NFO wings with "MOONDOGS" pre-embroidered was created by AV8RSTUFF for their "normal" (green) flightsuits and comes with velcro attached. The Moondogs of VMAQ-3 deployed to Incirlik, Turkey in early 2017 in support of combat operations for Operation INHERENT RESOLVE in supporting the fight against Da�esh. This BLANK blue nametag with pilot wings was created by AV8RSTUFF for their "normal" (green) flightsuits and does not come with velcro attached so that you can get it personalized yourself or I can for an additional $15 (it's what they charge me). The Moondogs of VMAQ-3 deployed to Incirlik, Turkey in early 2017 in support of combat operations for Operation INHERENT RESOLVE in supporting the fight against Da�esh. This BLANK blue nametag with NFO wings was created by AV8RSTUFF for their "normal" (green) flightsuits and does not come with velcro attached so that you can get it personalized yourself or I can for an additional $15 (it's what they charge me). Use this link to get the entire set of blue deployed patches for VMAQ-3 shown above. The Moondogs of VMAQ-3 deployed to Incirlik, Turkey in early 2017 in support of combat operations for Operation INHERENT RESOLVE in supporting the fight against Da�esh. This desert squadron patch was created by AV8RSTUFF for their deployed (desert) flightsuits. This one also has a difference in the "fur" of the wolves. This squadron patch has "furry" wolves instead of the "normal" stitching, and comes with velcro attached. This version is one of two "desert" versions they wanted.....this is the "REGULAR" version of their deployed squadron patch. The Moondogs of VMAQ-3 deployed to Incirlik, Turkey in early 2017 in support of combat operations for Operation INHERENT RESOLVE in supporting the fight against Da�esh. This desert EA-6B aircraft "bullet" patch was created by AV8RSTUFF for their deployed (desert) flightsuits and comes with velcro attached. This version is one of two "desert" versions they wanted.....this is the "REGULAR" version of their deployed aircraft patch. The Moondogs of VMAQ-3 deployed to Incirlik, Turkey in early 2017 in support of combat operations for Operation INHERENT RESOLVE in supporting the fight against Da�esh. 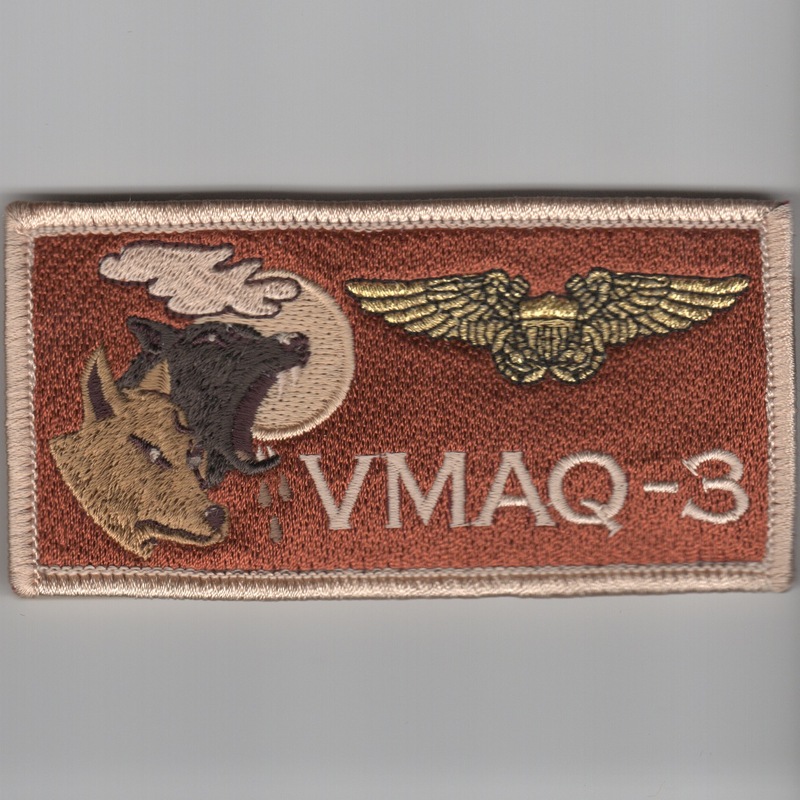 This "REGULAR' desert nametag with pilot wings with "VMAQ-3" pre-embroidered is one of the two desert versions created by AV8RSTUFF for their "desert" flightsuits and comes with velcro attached. The Moondogs of VMAQ-3 deployed to Incirlik, Turkey in early 2017 in support of combat operations for Operation INHERENT RESOLVE in supporting the fight against Da�esh. 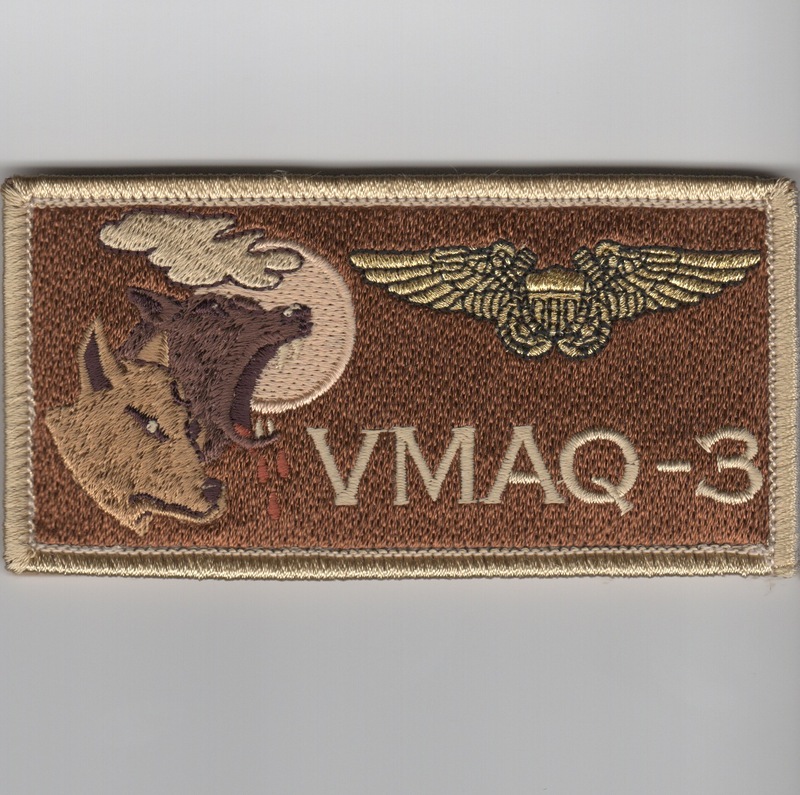 This 'REGULAR' desert nametag with NFO wings with "VMAQ-3" pre-embroidered is one of the two desert versions created by AV8RSTUFF for their "desert" flightsuits and comes with velcro attached. The Moondogs of VMAQ-3 deployed to Incirlik, Turkey in early 2017 in support of combat operations for Operation INHERENT RESOLVE in supporting the fight against Da�esh. This 'REGULAR' desert nametag with pilot wings with "MOONDOGS" pre-embroidered is one of the two desert versions created by AV8RSTUFF for their "desert" flightsuits and comes with velcro attached. 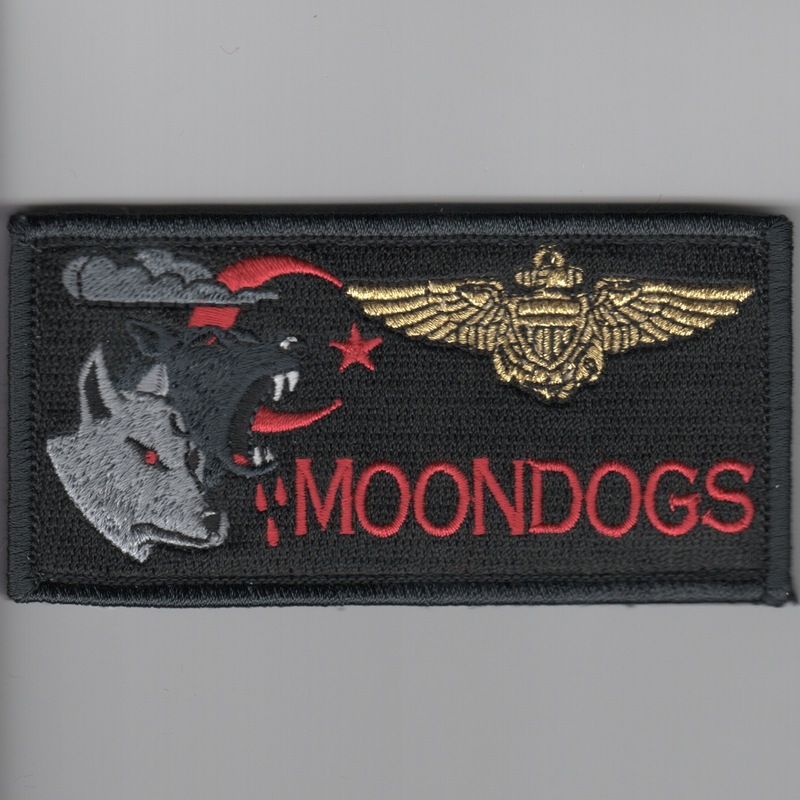 The Moondogs of VMAQ-3 deployed to Incirlik, Turkey in early 2017 in support of combat operations for Operation INHERENT RESOLVE in supporting the fight against Da�esh. 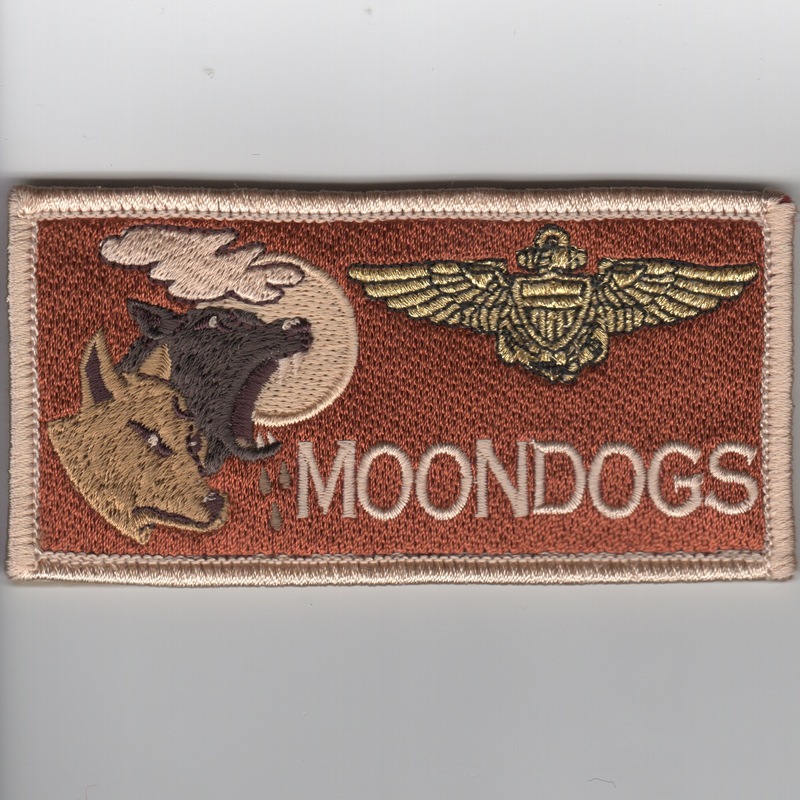 This 'REGULAR' desert nametag with NFO wings with "MOONDOGS" pre-embroidered is one of the two desert versions created by AV8RSTUFF for their "desert" flightsuits and comes with velcro attached. The Moondogs of VMAQ-3 deployed to Incirlik, Turkey in early 2017 in support of combat operations for Operation INHERENT RESOLVE in supporting the fight against Da�esh. This desert squadron patch was created by AV8RSTUFF for their deployed (desert) flightsuits. This one also has a difference in the "fur" of the wolves. 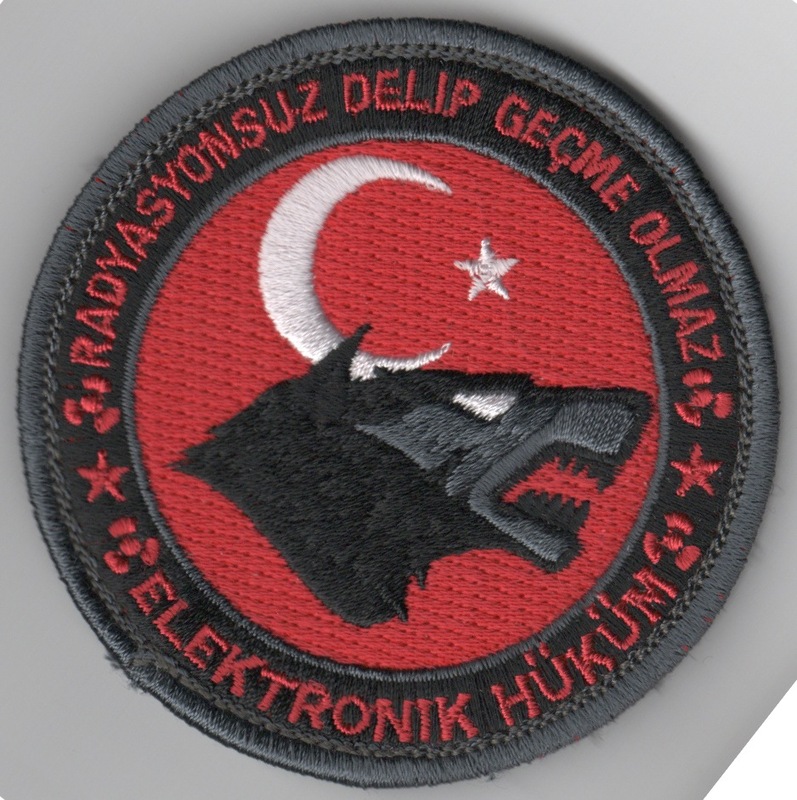 This squadron patch has "furry" wolves instead of the "normal" stitching, and comes with velcro attached. This version is one of two "desert" versions they wanted.....this is the "lighter tan" version of their deployed squadron patch. 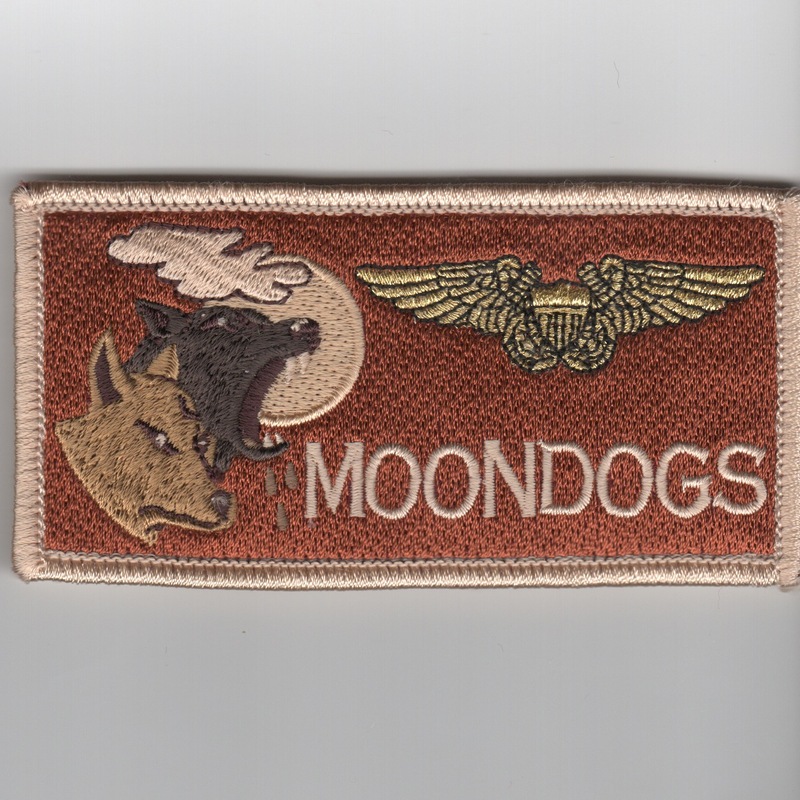 The Moondogs of VMAQ-3 deployed to Incirlik, Turkey in early 2017 in support of combat operations for Operation INHERENT RESOLVE in supporting the fight against Da�esh. 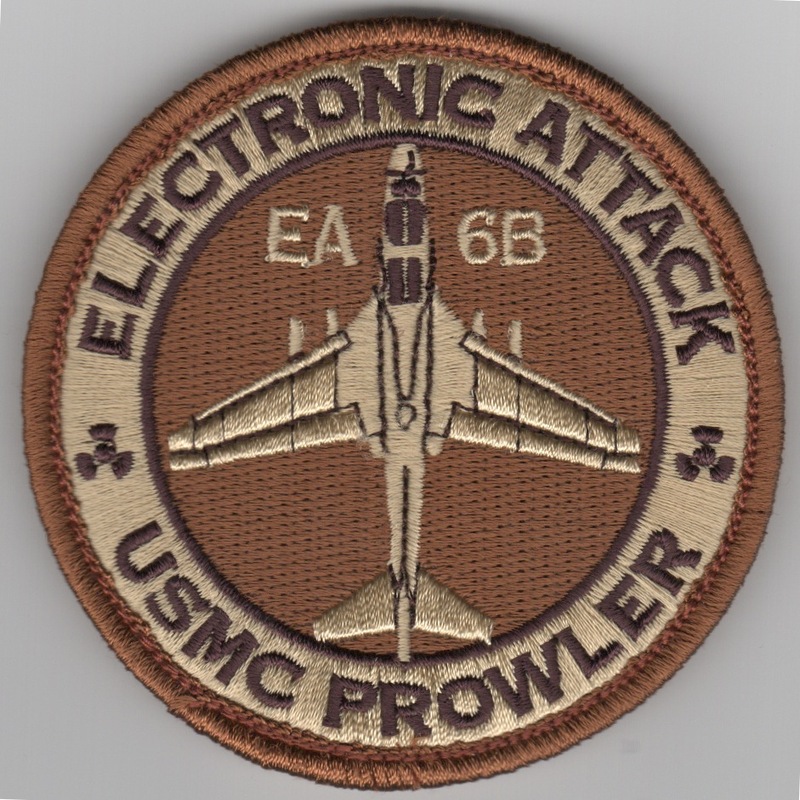 This desert EA-6B aircraft "bullet" patch was created by AV8RSTUFF for their deployed (desert) flightsuits and comes with velcro attached. This version is one of two "desert" versions they wanted.....this is the "lighter tan" version of their deployed aircraft patch. The Moondogs of VMAQ-3 deployed to Incirlik, Turkey in early 2017 in support of combat operations for Operation INHERENT RESOLVE in supporting the fight against Da�esh. 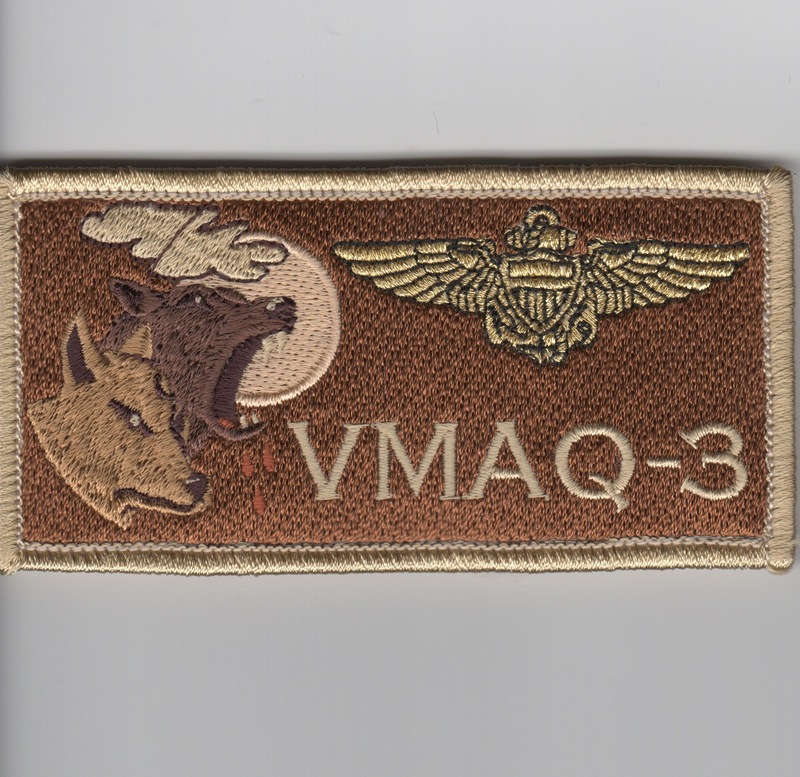 This "LIGHT' desert nametag with pilot wings with "VMAQ-3" pre-embroidered is one of the two desert versions created by AV8RSTUFF for their "desert" flightsuits and comes with velcro attached. The Moondogs of VMAQ-3 deployed to Incirlik, Turkey in early 2017 in support of combat operations for Operation INHERENT RESOLVE in supporting the fight against Da�esh. 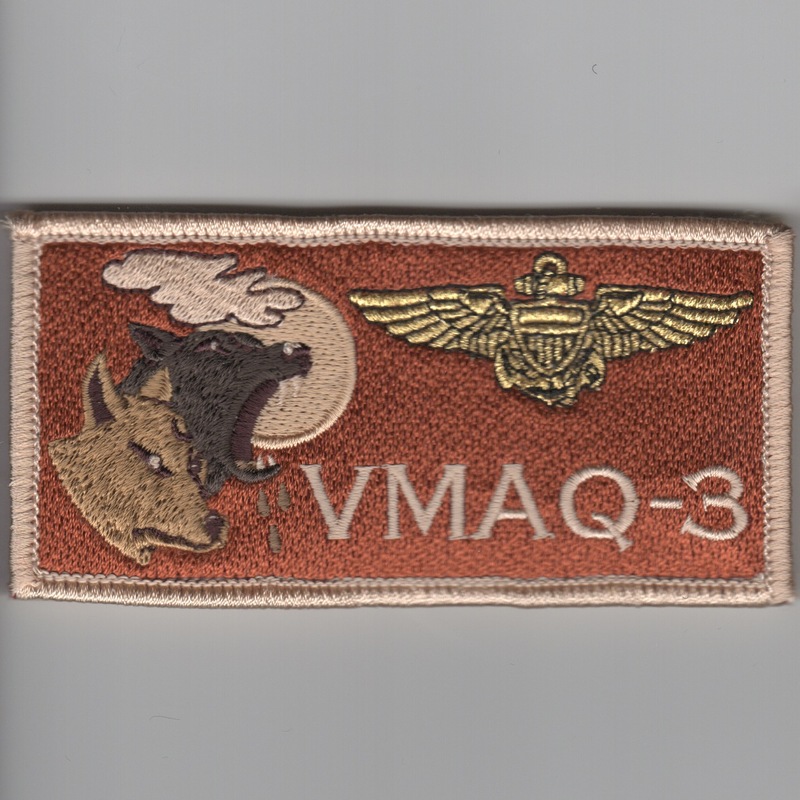 This 'LIGHT' desert nametag with NFO wings with "VMAQ-3" pre-embroidered is one of the two desert versions created by AV8RSTUFF for their "desert" flightsuits and comes with velcro attached. 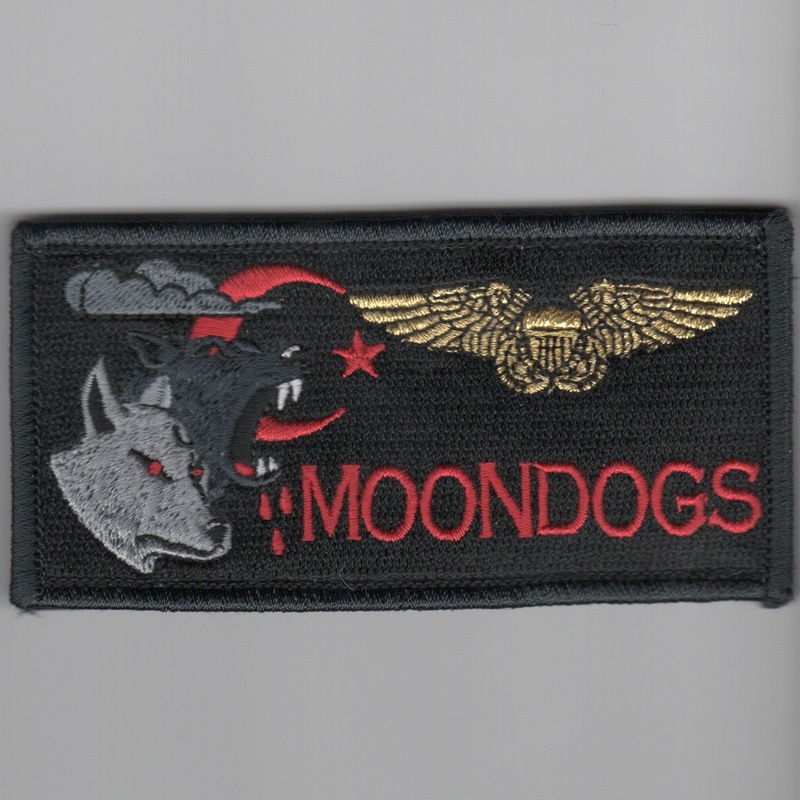 The Moondogs of VMAQ-3 deployed to Incirlik, Turkey in early 2017 in support of combat operations for Operation INHERENT RESOLVE in supporting the fight against Da�esh. 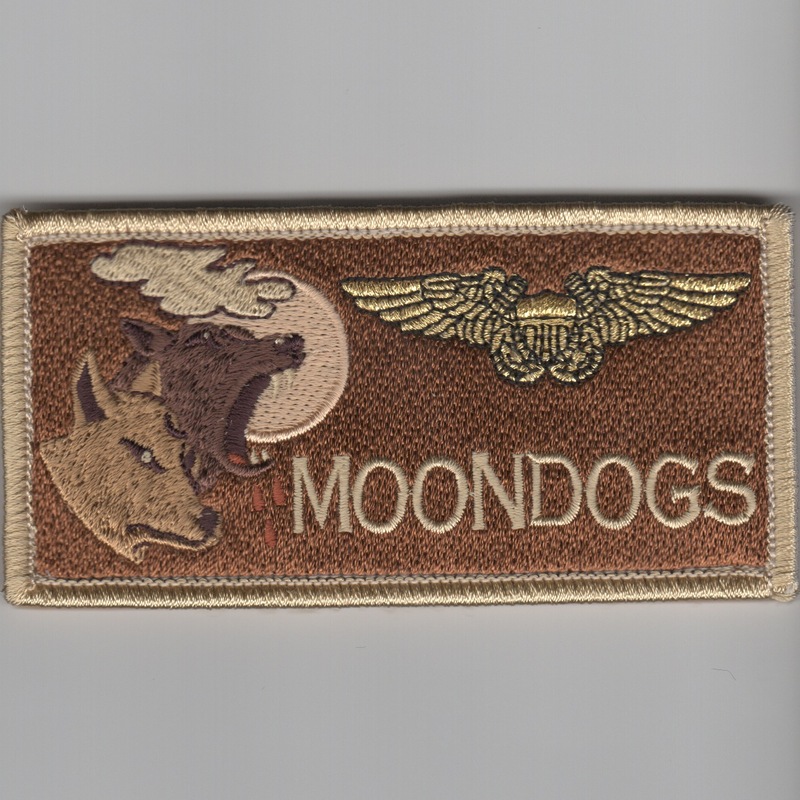 This 'LIGHT' desert nametag with pilot wings with "MOONDOGS" pre-embroidered is one of the two desert versions created by AV8RSTUFF for their "desert" flightsuits and comes with velcro attached. The Moondogs of VMAQ-3 deployed to Incirlik, Turkey in early 2017 in support of combat operations for Operation INHERENT RESOLVE in supporting the fight against Da�esh. 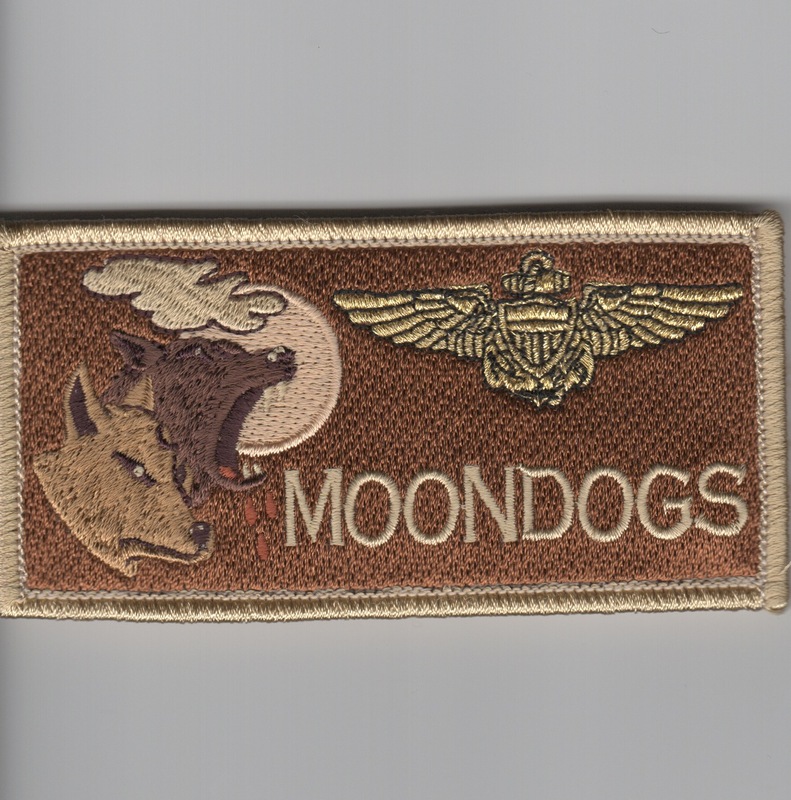 This 'LIGHT' desert nametag with NFO wings with "MOONDOGS" pre-embroidered is one of the two desert versions created by AV8RSTUFF for their "desert" flightsuits and comes with velcro attached. The Moondogs of VMAQ-3 deployed to Incirlik, Turkey in early 2017 in support of combat operations for Operation INHERENT RESOLVE in supporting the fight against Da�esh. This BLANK 'LIGHT' desert nametag with pilot wings was created by AV8RSTUFF for their "desert" flightsuits and does not come with velcro attached so that you can get it personalized yourself or I can for an additional $15 (it's what they charge me). The Moondogs of VMAQ-3 deployed to Incirlik, Turkey in early 2017 in support of combat operations for Operation INHERENT RESOLVE in supporting the fight against Da�esh. This BLANK 'LIGHT' desert nametag with NFO wings was created by AV8RSTUFF for their "desert" flightsuits and does not come with velcro attached so that you can get it personalized yourself or I can for an additional $15 (it's what they charge me). 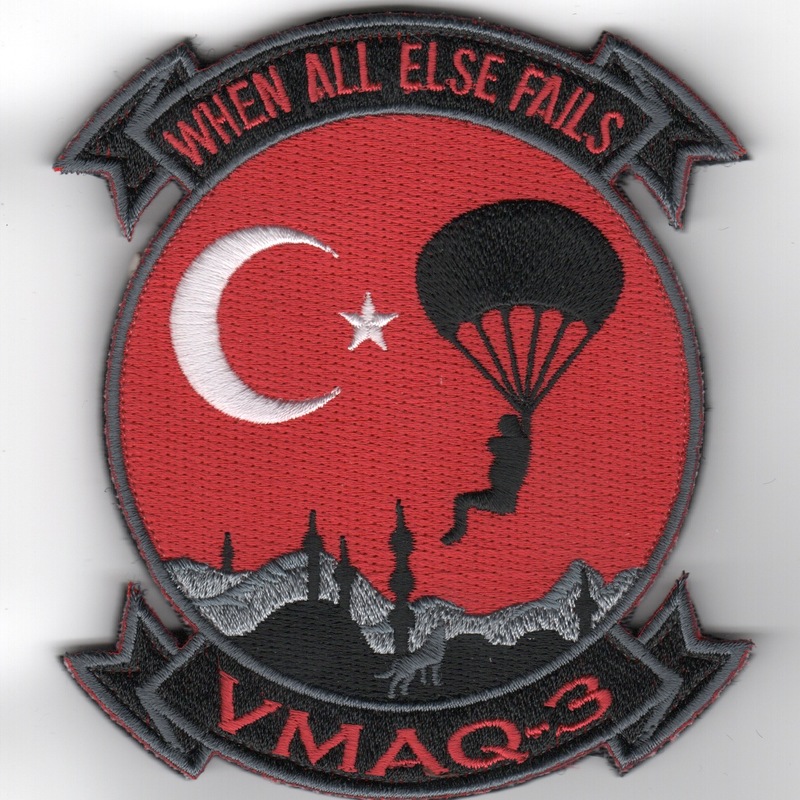 Use this link to get the entire set of desert deployed patches for VMAQ-3 shown above. The Moondogs of VMAQ-3 deployed to Incirlik, Turkey in early 2017 in support of combat operations for Operation INHERENT RESOLVE in supporting the fight against Da�esh. This red squadron patch was created by AV8RSTUFF for their deployment wear on their green flight suits on Fridays and comes with velcro attached. The Moondogs of VMAQ-3 deployed to Incirlik, Turkey in early 2017 in support of combat operations for Operation INHERENT RESOLVE in supporting the fight against Da�esh. 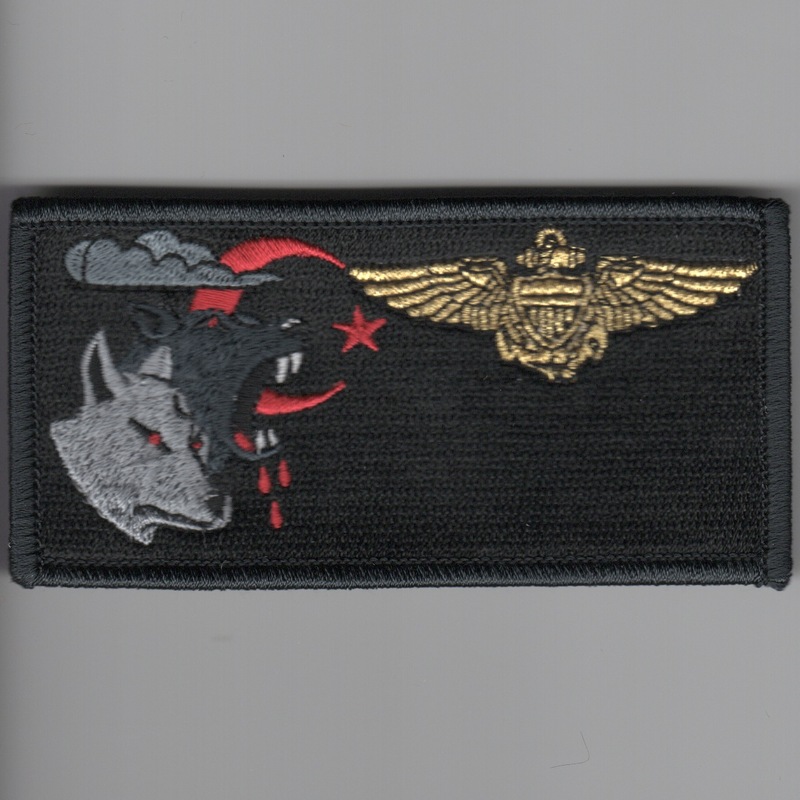 This red version of the lone wolfhead "bullet" with the Turkish flag in the background patch was created by AV8RSTUFF for their deployed (desert) flightsuits and comes with velcro attached. The Moondogs of VMAQ-3 deployed to Incirlik, Turkey in early 2017 in support of combat operations for Operation INHERENT RESOLVE in supporting the fight against Da�esh. 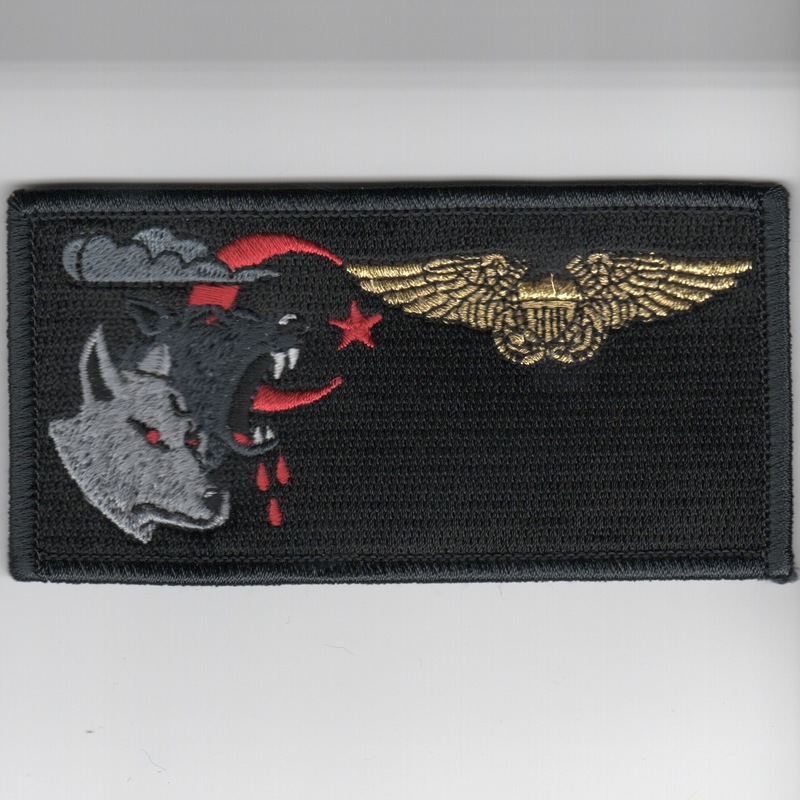 This black squadron patch was created by AV8RSTUFF for their "desert" (Fridays) flightsuit wear and notice the difference in the "fur" of the wolves. 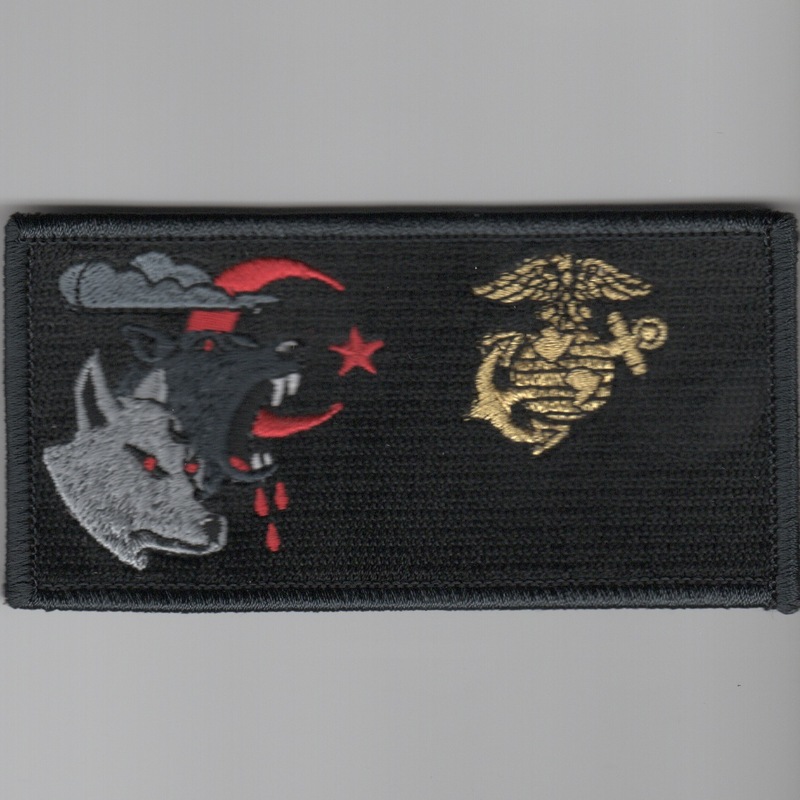 This squadron patch has "furry" wolves instead of the "normal" stitching, and comes with velcro attached. 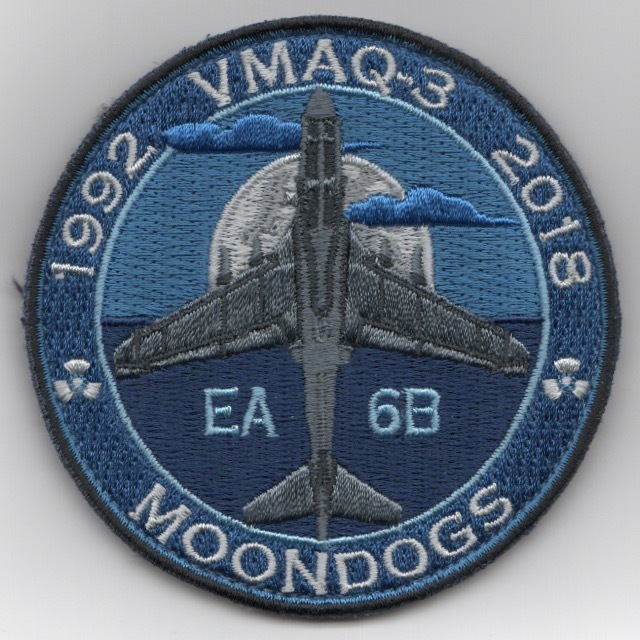 Another AV8RSTUFF Creation: The Moondogs of VMAQ-3 deployed to Incirlik, Turkey in early 2017 in support of combat operations for Operation INHERENT RESOLVE (OIR) in supporting the fight against Da�esh. This red "shop patch" was created by us for their flightsuit wear. It says "WHEN ALL ELSE FAILS" along the top, referring to the fact that "you always have your parachute" if everything else around you is failing and you have to get out of the bird. It comes with velcro attached. The Moondogs of VMAQ-3 deployed to Incirlik, Turkey in early 2017 in support of combat operations for Operation INHERENT RESOLVE in supporting the fight against Da�esh. 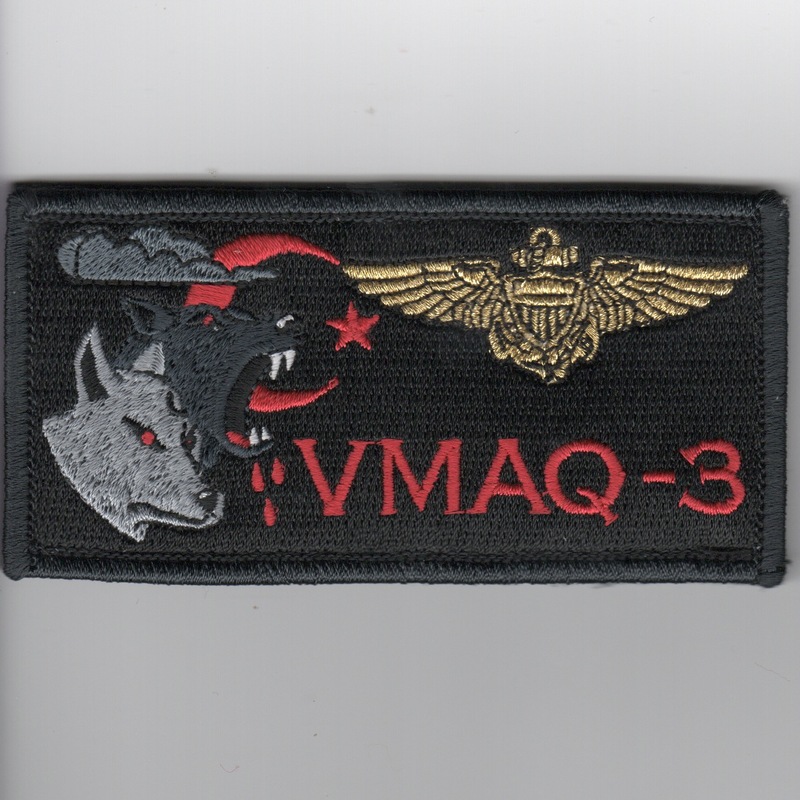 This black nametag with pilot wings with "VMAQ-3" pre-embroidered was created by AV8RSTUFF for their deployed wear and comes with velcro attached. The Moondogs of VMAQ-3 deployed to Incirlik, Turkey in early 2017 in support of combat operations for Operation INHERENT RESOLVE in supporting the fight against Da�esh. This black nametag with NFO wings with "VMAQ-3" pre-embroidered was created by AV8RSTUFF for their deployed wear and comes with velcro attached. The Moondogs of VMAQ-3 deployed to Incirlik, Turkey in early 2017 in support of combat operations for Operation INHERENT RESOLVE in supporting the fight against Da�esh. 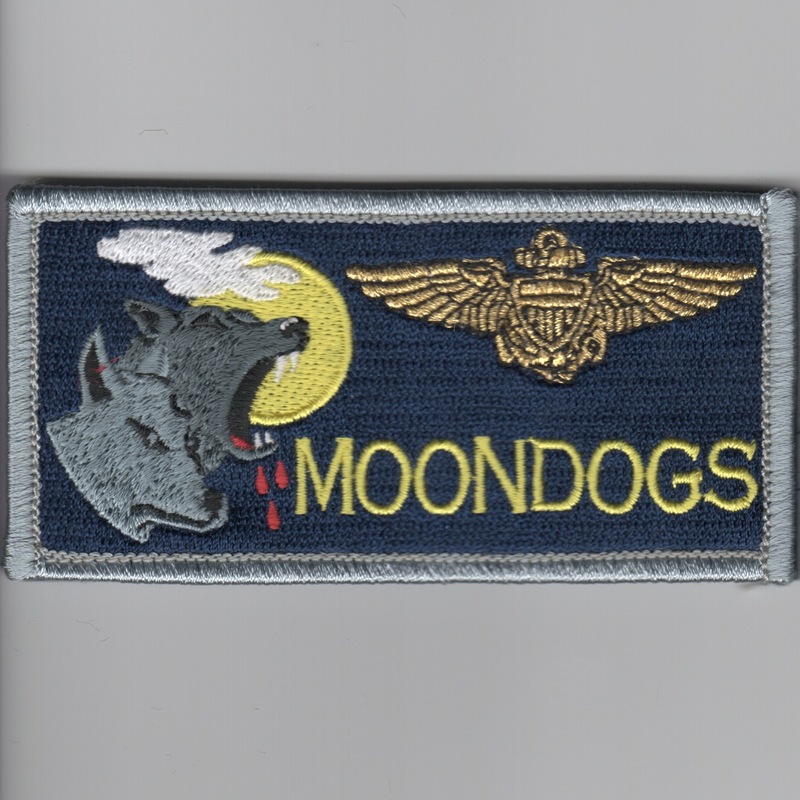 This black nametag with pilot wings with "MOONDOGS" pre-embroidered was created by AV8RSTUFF for their deployed wear and comes with velcro attached. The Moondogs of VMAQ-3 deployed to Incirlik, Turkey in early 2017 in support of combat operations for Operation INHERENT RESOLVE in supporting the fight against Da�esh. 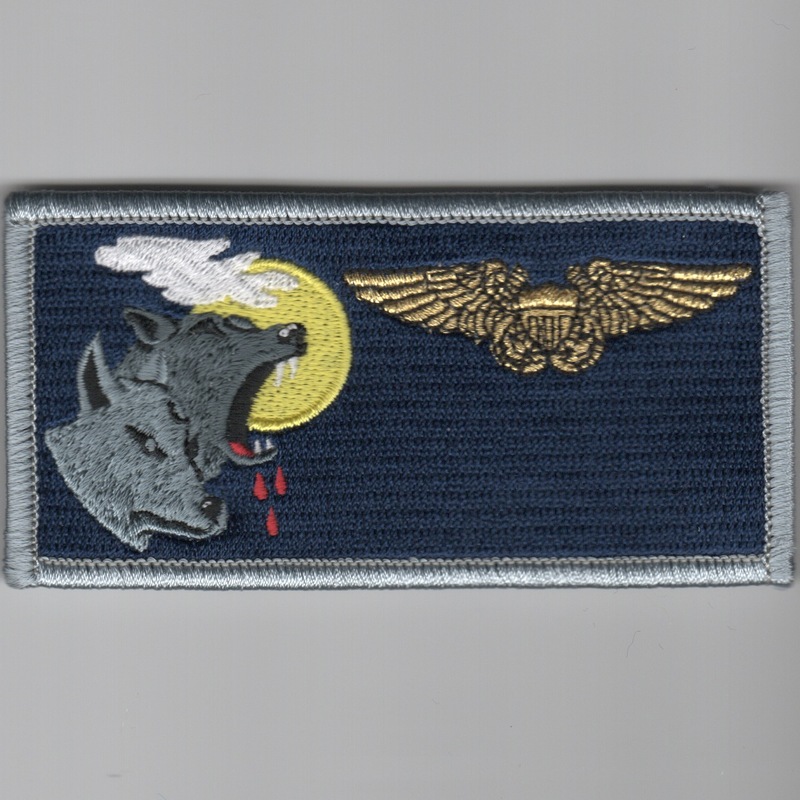 This black nametag with NFO wings with "MOONDOGS" pre-embroidered was created by AV8RSTUFF for their deployed wear and comes with velcro attached. The Moondogs of VMAQ-3 deployed to Incirlik, Turkey in early 2017 in support of combat operations for Operation INHERENT RESOLVE in supporting the fight against Da�esh. This BLANK black nametag with pilot wings was created by AV8RSTUFF for their deployed wear and does not come with velcro attached so that you can get it personalized yourself or I can for an additional $15 (it's what they charge me). The Moondogs of VMAQ-3 deployed to Incirlik, Turkey in early 2017 in support of combat operations for Operation INHERENT RESOLVE in supporting the fight against Da�esh. This BLANK black nametag with NFO wings was created by AV8RSTUFF for their deployed wear and does not come with velcro attached so that you can get it personalized yourself or I can for an additional $15 (it's what they charge me). 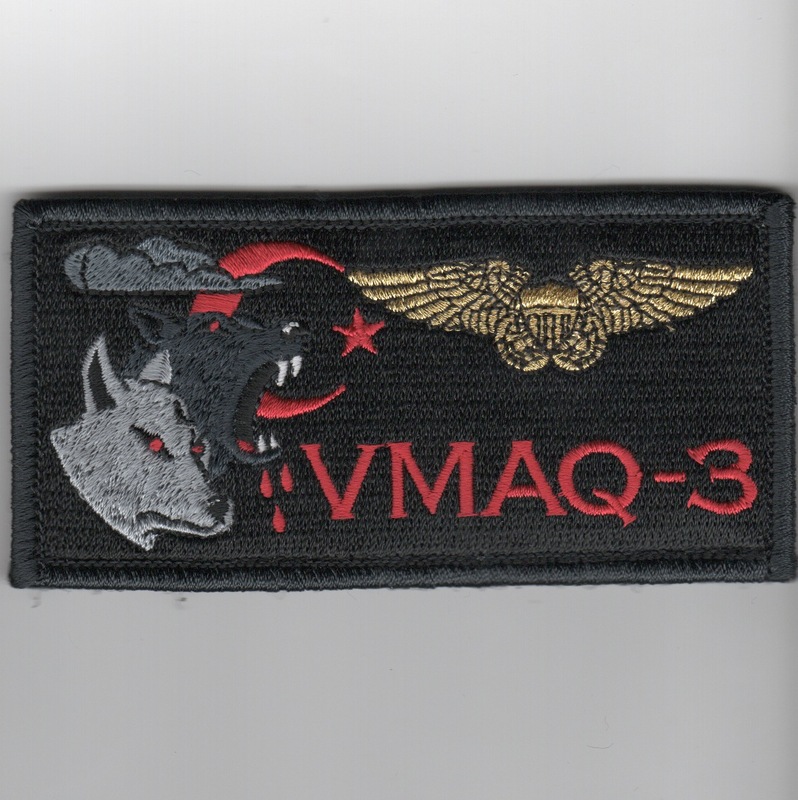 Use this link to get the entire set of black & red deployed patches for VMAQ-3 shown above. The Moondogs of VMAQ-3 deployed to Incirlik, Turkey in early 2017 in support of combat operations for Operation INHERENT RESOLVE in supporting the fight against Da�esh. This BLANK blue nametag with the USMC "Globe and Anchor" was created by AV8RSTUFF for their "normal" (green) flightsuits and does not come with velcro attached so that you can get it personalized yourself or I can for an additional $15 (it's what they charge me). 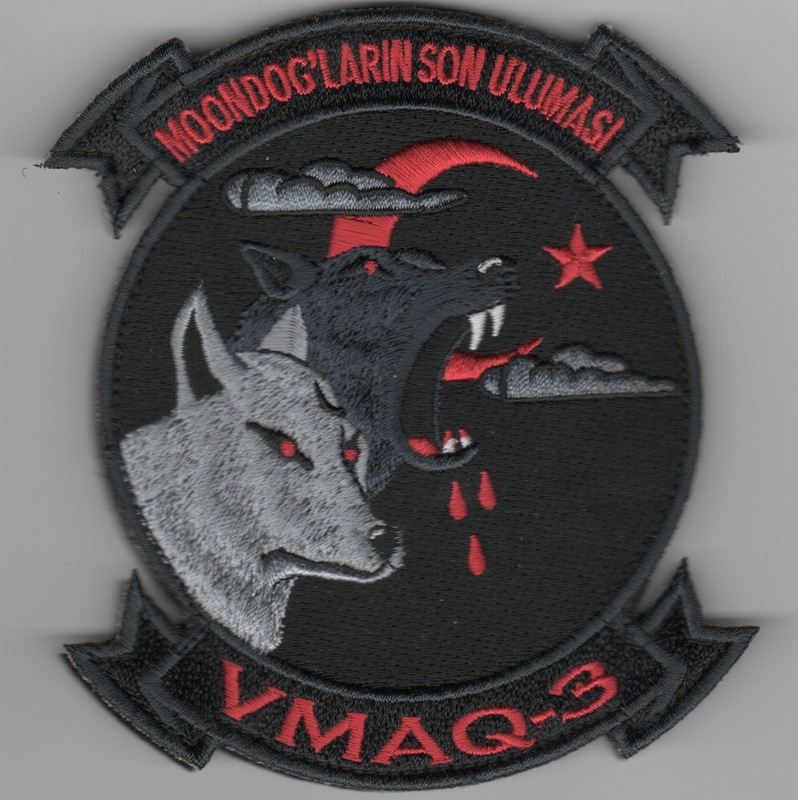 The Moondogs of VMAQ-3 deployed to Incirlik, Turkey in early 2017 in support of combat operations for Operation INHERENT RESOLVE in supporting the fight against Da�esh. This BLANK black nametag with the USMC "Globe and Anchor" was created by AV8RSTUFF for their "normal" (green) flightsuits and does not come with velcro attached so that you can get it personalized yourself or I can for an additional $15 (it's what they charge me). 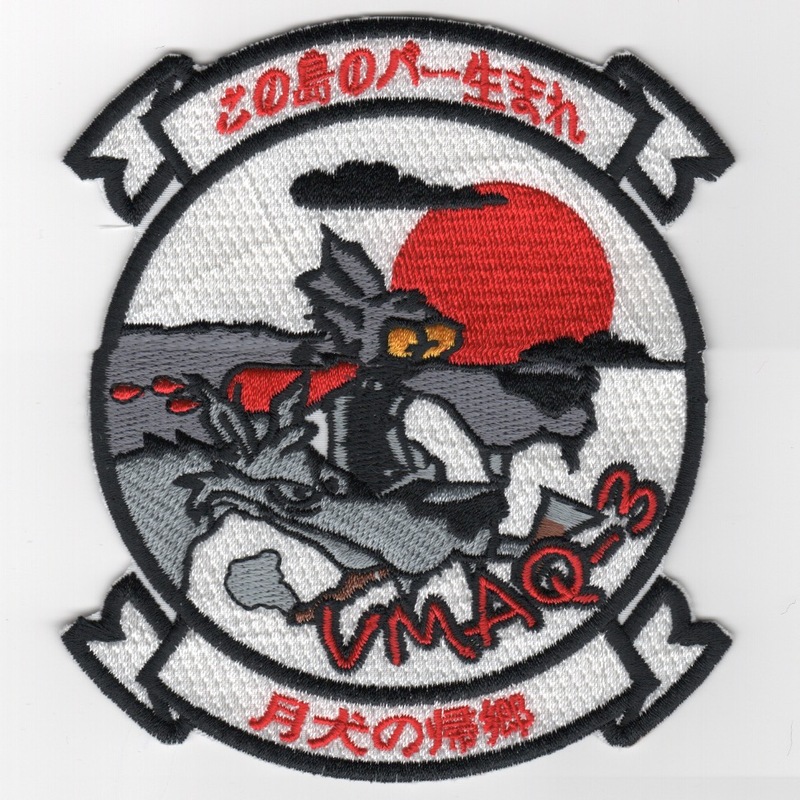 Homepage | Order VMAQ-4 Patches!